Something I'm sort of being forced into right now is catching up on all the stuff I've meant to read along the way. It's actually very satisfying as most of these reads (listens) turn out to be quite good and so I'm reading delightful thing after delightful thing. When I wrote about what I loved in 2015, I forgot a few things, namely this book. 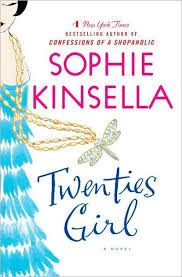 I can remember very clearly the experience of reading my first Sophie Kinsella book, Can You Keep a Secret? I remember the absolute compulsion to keep reading it as it was both funny and emotional. The world actually disappeared around me as I consumed the book. There is really no experience that is better and for years I've included it on my favorites list. But somehow, with the shifting tides of my own taste, I guess I thought I would enjoy her books less and so I put off reading them. For whatever reason, I decided to listen to Twenties Girl this fall and I'm so glad I did as I don't think I had a more enjoyable reading experience in the year. What I loved about this book is that yes it's funny in a somewhat absurd and over the top way and yes it's romantic in the way her books always are, but it has SO MUCH HEART. Just brimming with heart and goodwill. I think what I loved most about this book, though, was that it has a sort of redemption after death, Lara got to know Sadie in her ~afterlife, but got to know her life. And she regretted not having had the chance to know her better while she was alive and letting her die alone in a home. And they form this incredibly strong bond and I'm tearing up just writing about this, lol. There's something about the ties of family, the ones who came before and the precious reality of every life despite outward appearances. And they are so family even in Sadie's ghost state, they fight like sisters but obviously love each other very much. So...yeah. Still a huge fan of Sophie Kinsella. I also read Wedding Night and enjoyed it very much, though not nearly to the extent of this one, which might join Can You Keep a Secret? on the list of favorites.